It is the end of the school holidays and I have returned to work. As a teacher this time (!!!) instead of a teacher’s aide. I’m terrified at the prospect, but that’s another story. As I only have a few days left of ‘at home time’ I decided not to waste them. I’m going to clean the shed (gasp). Some background here; when we moved to our humpy in 2008 we had built a roof to park our caravan under which included an enclosed space in which to store all the stuff not currently in use. 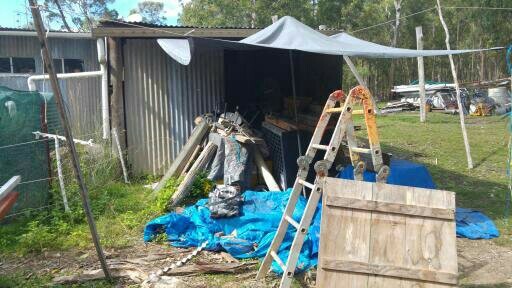 We moved our gear in the space of two days as we both had work to go to, so everything was just sort of dumped on the ground in the shed. It’s still there. 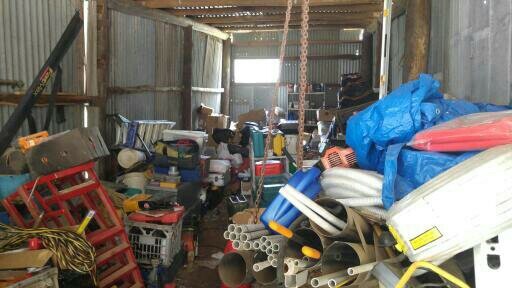 The entrance to the shed, all choked up with stuff that just wouldn’t fit into the mess any more. Inside this mess. 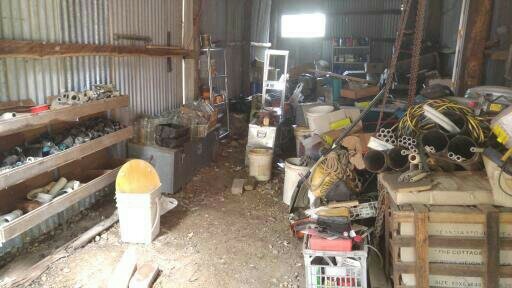 I know it looks like a hoarder’s hideout. Anything we needed from the shed was dug out and moved into the humpy proper over the years, but there is a LOT of stuff that I obviously haven’t missed or needed in there…somewhere. 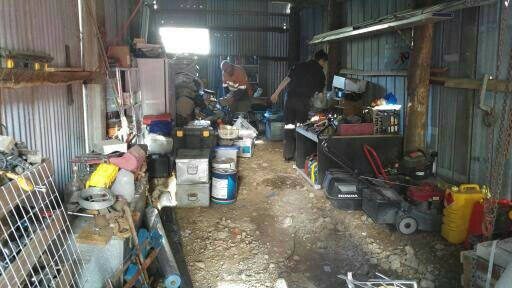 Also, my long suffering (and annoying) partner has stored his tools in the front part of the shed during that time. Now I am embarking on a whole new phase of my working life (and getting a car licence as part of that), I decided that it’s time to symbolically and literally clean out the clutter. I’m not sure what is in there, but it’s time to find out. 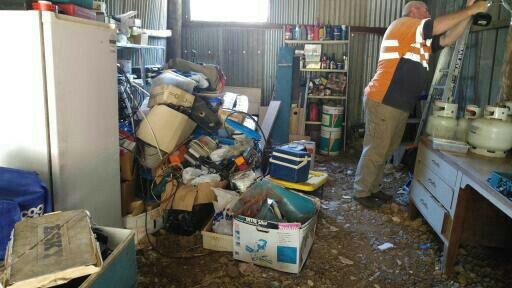 Most of the contents of the shed will probably go to either the dump or (preferably) to other people’s sheds. I have friends who can probably use some of it. We (my daughter and I) moved everything from in front of the doors and cleared the first little part of the tool section. Of course it decided to rain intermittently so we had to cover everything with tarps and the black snake (I call him Brian) was disturbed by all the deconstruction happening in his winter abode and decided to emerge from the mess, sending my daughter back to the house for a few hours. Day 2; We continued to dig out archeological finds from the mess; two drills that haven’t been used in years, ten complete door locks still in their wrapping, my six crates of Fowlers bottles for preserving food. 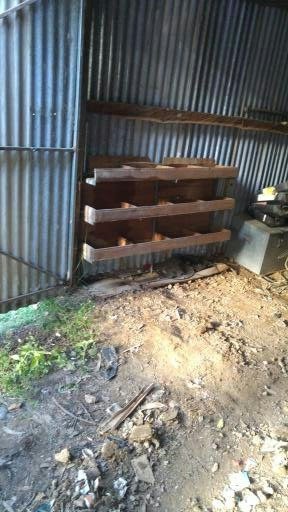 We put together some of the metal shelves we bought from Bunnings an age ago for just this purpose and began putting things away. The work is frustratingly slow as every box in there is falling to pieces, meaning that I have to pick up things (sometimes tiny things) from the ground and find new containers for them. I am enjoying getting rid of a lot of stuff though. The work continues. Day 3; My daughter used old coffee jars (the big glass ones) to re-home countless bolts, screws, nails and mysterious bits of metal. Now all we need are some more shelves to put them on. I am returning to work this week so work on the shed will be a lot slower for a while, it will get done though. Things are starting to go back into the shed. We put up some brackets to hang things on the wall. That pile of stuff behind my partner is all his to put away. Day 5: We continue to work on the shed project…very slowly. We found a couple of old (very dead) fridges that we are using to house my partner’s tool collection which keeps all his electrical stuff out of the dust, moisture and marauding rodents. 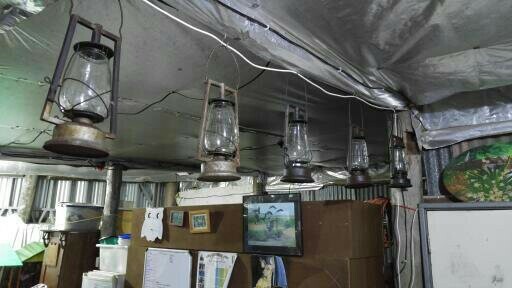 I also found a series of old hurricane lamps that I had been keeping ‘just in case’. 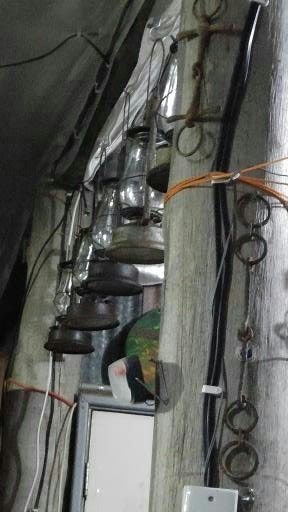 I decided to put them in the humpy as decoration, and as a backup for lighting (they are still fully functional). 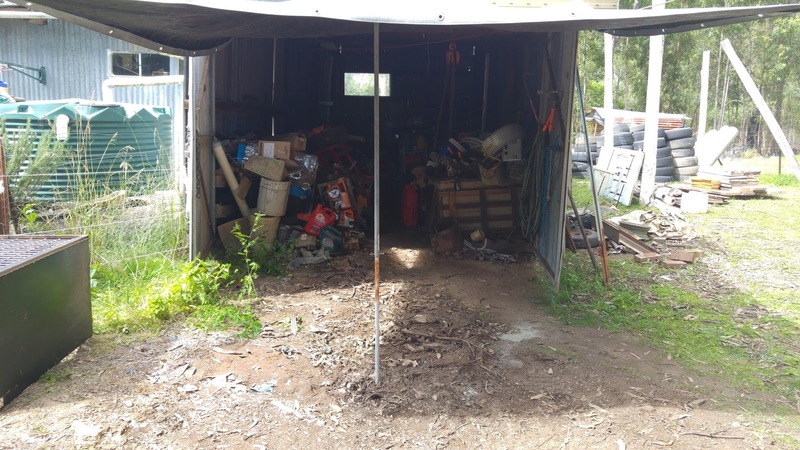 I was hoping to delay this post until the shed was a shining example of organisation and cleanliness, but it now seems that that vision is a fair way in the future so this will become a two part post. It may not seem to be any neater from my photos, but I assure you it is much better. I look forward to the day when the shed is done.